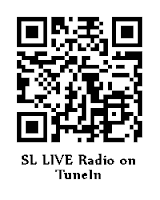 SL Lḯνє Radio, the radio for your second life. We broadcast across the grid with the best EDM dance music with a pinch of pop, live shows - both music and chat, plus updates on what is happening in SL. (inworld - paste the link into your land or add to your radio. © 2013 Copyright SL LIVE Radio. All Rights Reserved . Powered by Blogger.